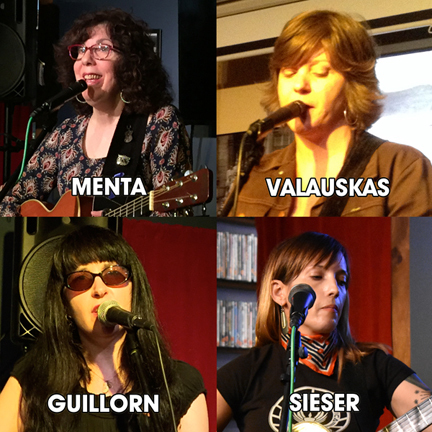 The singer-songwriters Anne Marie Menta, Kierstin Sieser, Lys Guillorn, and Shellye Valuaskas trade off songs Friday, Apr. 5, at Best Video Performance Space. The show starts at 8 PM and the cover is a sliding scale of $5-10 (pay what you can in that range). 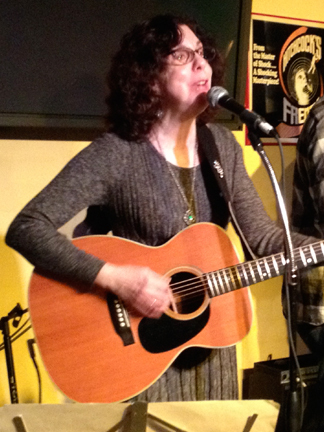 Anne Marie Menta is a longtime New Haven singer songwriter working on her fourth album. 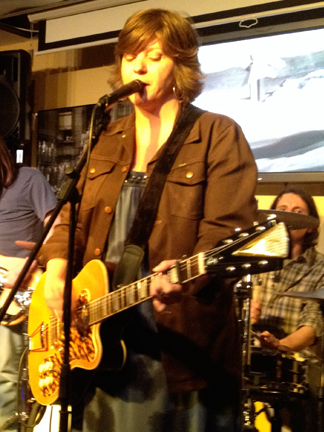 Personal meets universal in her lyrical, catchy, folk/pop/country influenced tunes. Shellye Valauskas writes meticulously crafted power pop songs that shimmer and shine; think Rasberries/BigStar/Posies/dB’s/Slight R.E.M. Listen to her latest release “History of Panic” and try not to fall in love with it. Kierstin Sieser is lead vocalist and songwriter from Tiny Ocean, whose music is part dreamy Americana, part strange folk rock and a little psychedelia. 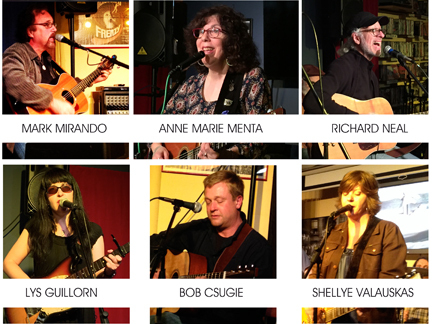 Singer-songwriters Anne Marie Menta and Shellye Valauskas give their backing bands the slip for a night, playing solo sets—and perhaps some songs together—on Friday, July 24. The music starts at 8 PM and the cover is $5. 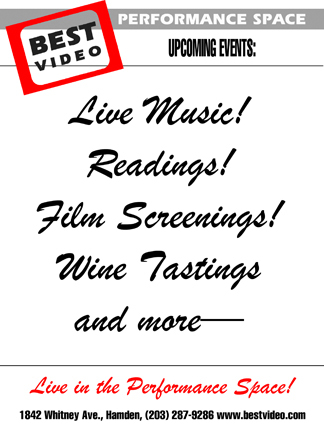 The Shellye Valauskas Experience plays the Best Video Performance Space on Thursday, Feb. 27. The music starts at 8 PM and the cover is $5. It’s Shellye’s Birthday Bash. Join The Shellye Valauskas Experience to celebrate her birthday. Very special guest: Cake! (And not the band Cake.) Plus other special guests—not that anyone could follow a slice of birthday cake. The Shellye Valauskas Experience will perform in the Best Video Performance Space on Wednesday, Feb. 27. The cover charge is $5 and the music starts at 8 PM. This show takes place on Shellye’s birthday so come celebrate with her and the band! 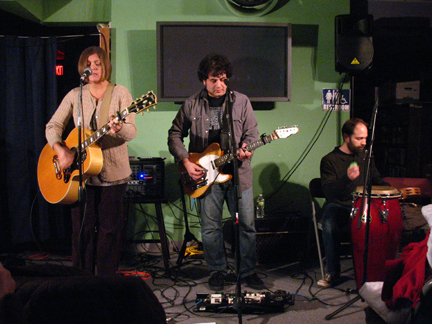 As her songwriting collaborator and bandmate, she enlisted ace guitarist Dean Falcone, who’s served the Connecticut music scene since the early ’80s with Jon Brion in The Excerpts, his own Dean and the Dragsters, and a host of others. Valauskas and Falcone’s shared love for the intelligent, heartwarming yet punchy pop of Crowded House, The Posies and Aimee Mann, as well as the burgeoning Americana movement, helped them nail a distinctive yet accessible radio-friendly sound from the start.